Following on the heels of the aptly named Kicker cocktail, we have the Knock Out. I’m guessing that the absinthe in here (at least for Lommebogen and Savoy) is the reason for this name. This was the first time I needed to use Crème de Menthe so I took myself down to Juul’s to see what they had. I opted for the nicer, and more expensive Tempus Fugit, over Bols, and I’m super happy I did. It has such good flavor that isn’t utterly buried in sugar. A good crème makes such a difference. (For the record a crème liqueur does not have anything to do with cream. The name comes from them being generally higher in sugar than the average liqueur, which gives a “creamier” mouth feel.) Not sure where Café Royal swapped out the absinthe for rum, but it definitely changes the nature of the drink entirely. OK, this is one of those cocktails that I’m going into expecting to hate. I don’t like absinthe and this just sounds like a mix destined to be dumped. Due to my misgivings, I only made a half recipe so I wouldn’t have to toss too much gin. Yes, I tossed it, but I could see how this is a nice cocktail if you like absinthe. The mint and absinthe do go together very well. 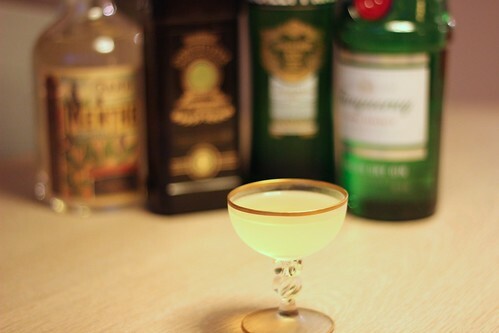 In many ways, the Café Royal version of this is more like the Kicker cocktail, but it actually has enough vermouth to have a real impact on the drink. Or I guess it could be a martini with rum in it. Either way, it isn’t really that great a cocktail. Neither of these two cocktails are something I would choose to drink again.